Join neighbors from around North Central Austin next Saturday, December 3, at 2 PM to plant nine trees at the intersection of N. Lamar and 2222. Parking is available in the DPS parking lot on the northeast corner of the intersection. We need plenty of people to help, because the trees will be planted on the southeast corner. Everything will need to be moved across the intersection at the pedestrian crossing. This is the third of many tree-plantings in North Central Austin on major streets and intersections. It’s part of a long-term initiative by Sustainable Neighborhoods to bring shade to sidewalks and beauty to the most visible parts of our community. Next spring we intend to plant another five trees at this same intersection, then 50 trees on Burnet Rd from 2222 to Anderson. 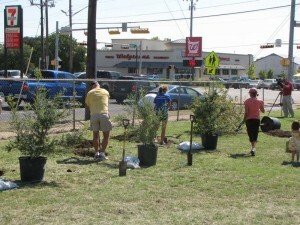 We’re identifying other tree-planting opportunities in North Central Austin for autumn 2012. These are challenging locations to establish trees, but the long-term result will be transformative. You can contribute to this project by volunteering, or by donating via PayPal – Click here to donate.